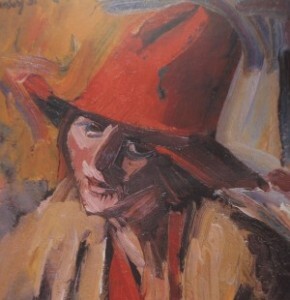 David Bomberg was born in Birmingham in 1890. He trained as a lithographer before studying painting in London at the Westminster School of Art (1908-10) and the Slade School of Art (1911-13). In 1913 he travelled to France where he met Modigliani and Picasso and over the next few years his paintings combined abstract and Vorticist influences. His first one-man-show followed in 1914 at the Chenil Gallery. His later powerful, thickly painted oils strongly influenced such pupils as Auerbach, Kossoff and Creffield. Bomberg’s work is held in inumerable private and public collections throughout the world.